What is one asset of your community? What is the most significant need in your community? 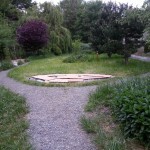 Since I used the community orchard as one of the photos, I thought I’d share my project. I’m in an accelerated program and have time for almost nothing outside of school, so I haven’t yet made it to any of the work parties, but every day when I pass this space, I am filled with joy and gratitude. Thanks for all you do to make our community stronger! I pass an area on my walk home from school every day. Off of I-5, on the corner of N. 50th Street in the Green Lake/Wallingford neighborhood of Seattle, this image is not unique. 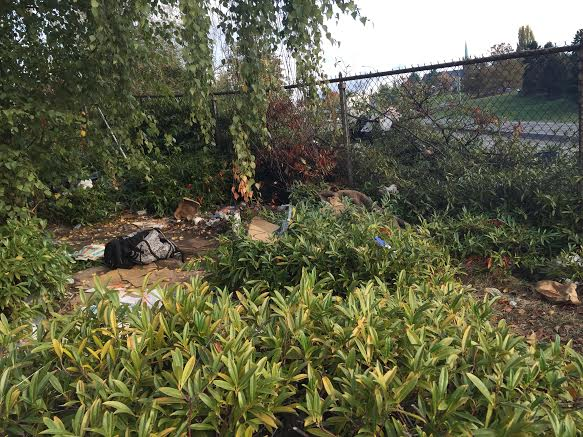 Cans, cardboard, and an assortment of garbage are heaped in piles along many areas of the Interstate. 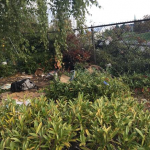 What this image depicts is unsightly and unsanitary, but what you don’t see here is that this is the home of several residents of my community. 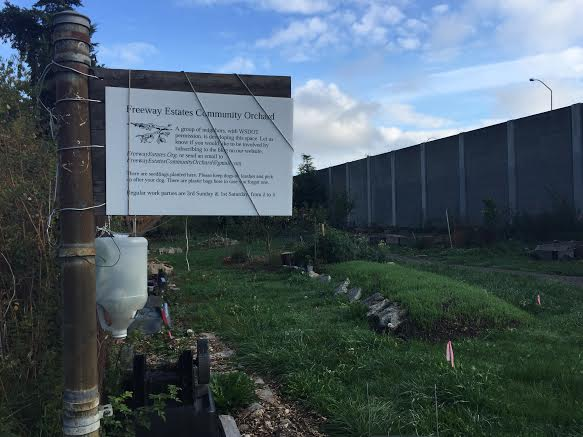 Since I moved to my neighborhood six months ago, I have witnessed the ongoing development of this community orchard as I pass by it on the way to my bus stop every morning. 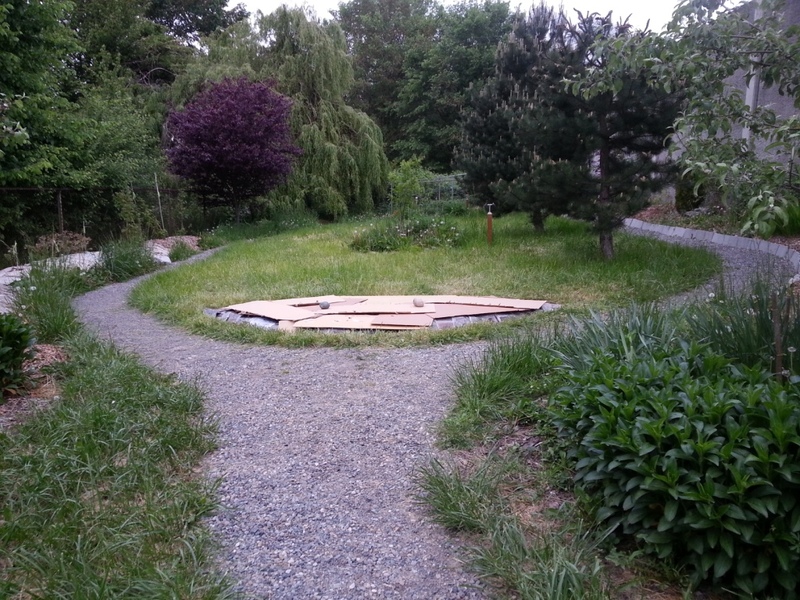 It is located off I-5 in Seattle’s Green Lake neighborhood at NE 60th Street. 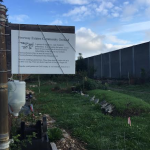 To me, this project epitomizes how the assets of my community can be directed toward sustainability, neighborhood partnership, and food and agriculture education. It is a powerful response to the community need depicted above. A sign off to the right of this photo boasts, “ANYONE CAN HELP.” Though projects like this may displace members of the community who reside along the Interstate, it does offer them a place to access free food directly from the land, as well as an opportunity to get involved. With all this appreciation coming our way, it’s high time to appreciate the people who put a lot into this project in the last year — the 20-Hour Club. Each volunteered 20 or more hours in the last 12 months. The Club celebrated in January and I asked, 1) what inspired each of them to work on this project and 2) what would make it a better space for the community. Some of their responses follow. 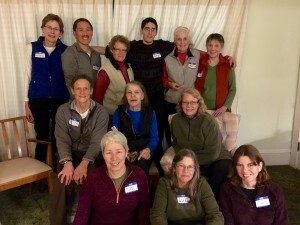 Many in this 20-Hour Club brought in friends and family to help out last year. In all, we could not have accomplished what we did without the 100+ other volunteers, including the students from Kids Co. and Hazel Wolf school. Thank you all. It’s been wonderful to meet so many people who just enjoy helping out. This entry was posted in Marketing & Outreach, Uncategorized and tagged appreciations, community, volunteer on May 22, 2016 by Ruth. April 30, 2016 was the last day to spend our Seattle Neighborhood Matching Grant funds. We accomplished so much this past 14 months (see prior blog post) but we were still missing a bench. Last year, there was no time to rest but, this year, there is! We made an effort, searching Craigslist, UW surplus and Second Use websites, but there was hardly a bench to be found. Then, an amazing gift came our way. On Sunday, April 17, we were short on volunteers so I kept my eyes open, hoping to spot more of our regulars. I didn’t want to get my hopes up but it looked like three men were walking toward the orchard. It was sunny that day so I raised my hand to my eyebrow to see well. Yes! They were coming our way. Three fine young men from the neighborhood showed up to volunteer. Sturdy and alert, Brooks, Drew and Nathan built a rubble frame for a garden bed, added a couple of shelves to the shed, and dug out a big root ball of Cotoneaster. 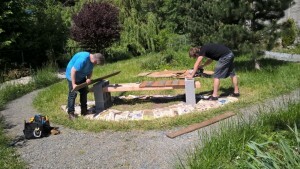 When the work was finished, Brooks turned to Sue and me and said, “You need a bench.” I smiled ear to ear. Just in the nick of time, before our grant money ran out, these men did it all: designed the bench, picked a good sitting area, shopped for materials, sheet mulched the sitting area, picked up a load of cedar chips, sanded and sealed the wood and finished the bench on April 30. Cement block and fir 4x4s serve as the base. Our old rotting wood pallets could be salvaged into slats so Drew took them home to cut them up. However, as luck would have it, just a block from his house, he spotted a free pile of old cedar fence boards and he used those instead. 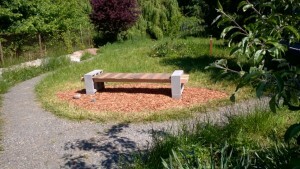 Six inches of cedar chips lie beneath the bench, which won’t decompose as fast as arborist chips. Please consider showing up at one of the May work parties. We have a lot to accomplish before summer. Also, save the date – Sunday, October 2, is our sixth annual cider fest. This entry was posted in Construction, Grants & Fundraising, Uncategorized and tagged bench, rest, volunteer on May 3, 2016 by Ruth. We are conscious of the demands for your attention. We send information only about twice per month. Subscription problems? Plant Pathogens – Pasteurize? Sterilize? Sanitize? Boil Everything! The GET INVOLVED page is where you can give us feedback. Proudly powered by WordPress Freeway Estates theme by Dean Wenick. © 2019 Freeway Estates Community Orchard.